Just last weekend, Emmanuel Macron was elected as the youngest president of France since Napoleon. He beat his right-wing competitor Marine Le Pen by almost two-thirds. As he approaches the challenges that lay ahead of him, we want to see: What publishers were most visible in Google News on the mobile and desktop devices of the French public? And what has changed since our pre-election analysis? The News Dashboard team took a closer look at how the top 10 publishers for mobile and desktop performed for May 5-May 7, 2017. We compared the desktop visibility for our election keyword set directly to the pre-election results. Then, we looked at the mobile performance. Last, we found who ranked and where in the News Boxes for “Emmanuel Macron” and “Marine Le Pen” on Election Sunday. As always, you can find the summary and keyword sets at the bottom of the analysis. Most competitors from the pre-election stayed relevant for the main part of the French presidential election. Above is a comparison of the top 10 most visible publishers in desktop News Boxes for the pre-election and the election. You see many familiar faces, but while eight out of 10 publishers go to the second round, lepoint.fr and ouest-france.fr were expelled from the top ranks by lci.fr and bfmtv.com. While the visibility of four publishers was lower than before, it rose for three publishers. Lemonde.fr is especially interesting, as the publisher’s visibility for the same keyword set improved by about 6 percent. In comparison, for lefigaro.fr, europe1.fr and liberation.fr the increase was just around 1 percent. The overall Google News visibility decrease for the pre-existing publishers was also right around 1 percent. Only 20minutes.fr lost 2 percent of their visibility. 20minutes.fr is the only publisher that scores over 10 percent visibility in AMP Carousels for the election keywords. To change things up a bit, instead of looking at the mobile News Boxes, we centered our attention on AMP Carousels. While this provides the best possible insight on mobile visibility, we can’t directly compare these results to last week’s analysis. Even though 20minutes.fr lost some desktop visibility, they were even stronger for mobile AMP Carousels, where they were visible in 10.43 percent of all AMP Carousels with our keywords. 20minutes.fr is the sole publisher that scored over the 10 percent mark. While this score is lower than we have seen in AMP analyses, taking data from three consecutive days while search interest and publisher rivalry was incredibly high over the election means 10 percent is rather impressive. Only four publishers went directly from the desktop top 10 to the AMP top 10. But three of these publishers – 20minutes.fr, lci.fr and liberation.fr – dominated the top half of the mobile, while they were in the bottom half of the desktop’s top 10. Surprisingly, it was the opposite for francetvinfo.fr. Another incredible finding is that most of the publishers were extremely close to each other, and only two of them – francetvinfor.fr and lesechos.fr – scored under 5 percent. 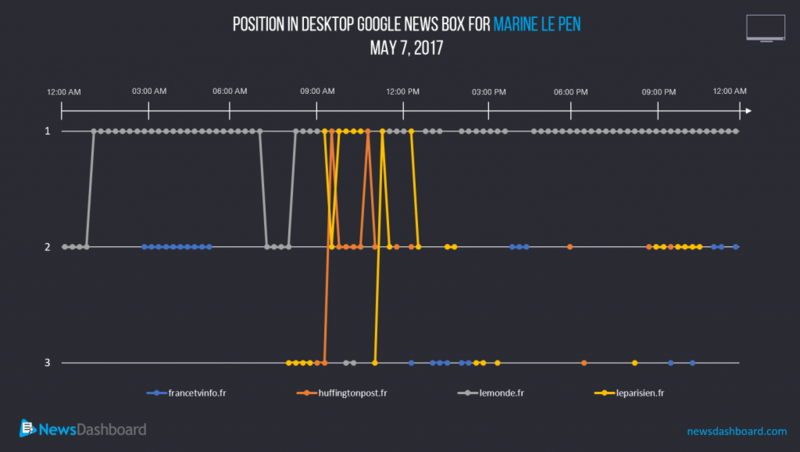 Lemonde.fr is the dominant publisher in the Desktop News Box for Marine Le Pen on Election Day. 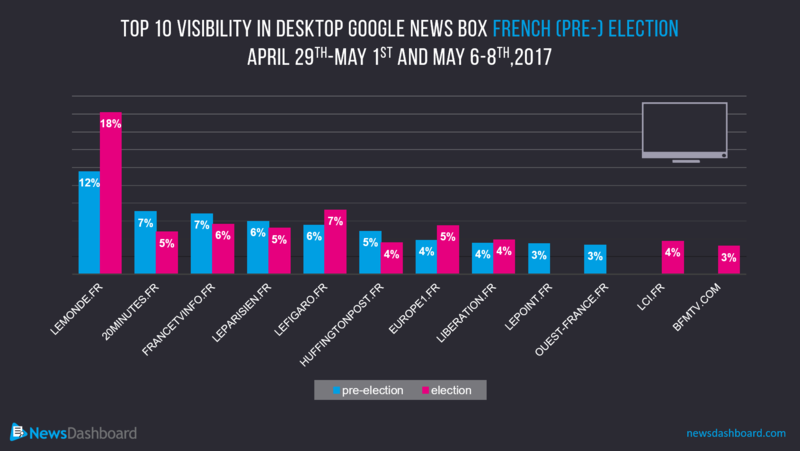 First, we determined the top 5 most visible desktop publishers on a Election Sunday for a three-word keyword set around Marine Le Pen. While there are only four in the above graphic, there were five chosen publishers. One publisher – ouest-france.fr – did so incredibly well for the other two keywords that while they were in the top 5, but they did not appear in the News Box for “Marine Le Pen.” Keep in mind that the other News Box spots were not empty, but that our graphic would be too crowded to read without paring it down. Clearly, lemonde.fr stayed in the saddle the longest, spending almost the entire day in the first position in the News Box. Only in the late morning did leparisien.fr and huffingtonpost.fr get a share of the pole position. From late morning until evening, they also regularly but not consistently appeared on other positions in the News Box. Francetvinfo.fr also played a role on positions two and three in the earliest morning hours, in the afternoon and at night. 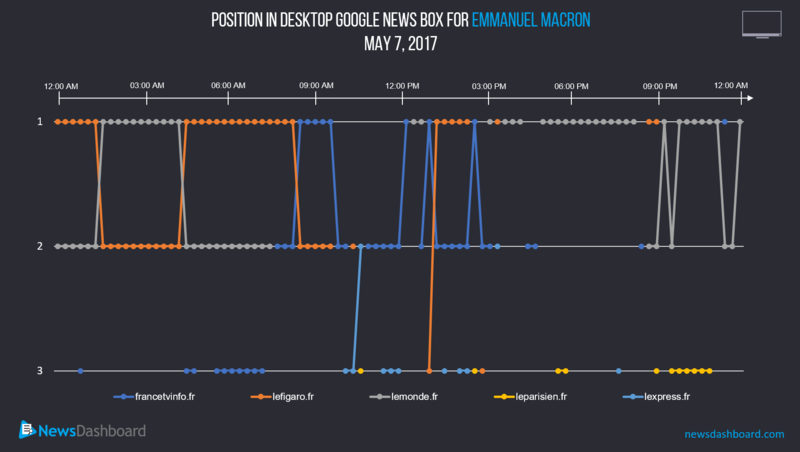 Three publishers almost exclusively take the lead position in the Desktop News Box for Emmanuel Macron on Election Day. As before, we have also created a three-word keyword set around Macron. All five publishers took their places in the desktop News Box and heavily so. Especially francetvinfo.fr, lemonde.fr and lefigaro.fr dominated the first two positions throughout the day. Lexpress.fr made an appearance around noon, and leparisien.fr was in the News Box from the afternoon onward at the third position. 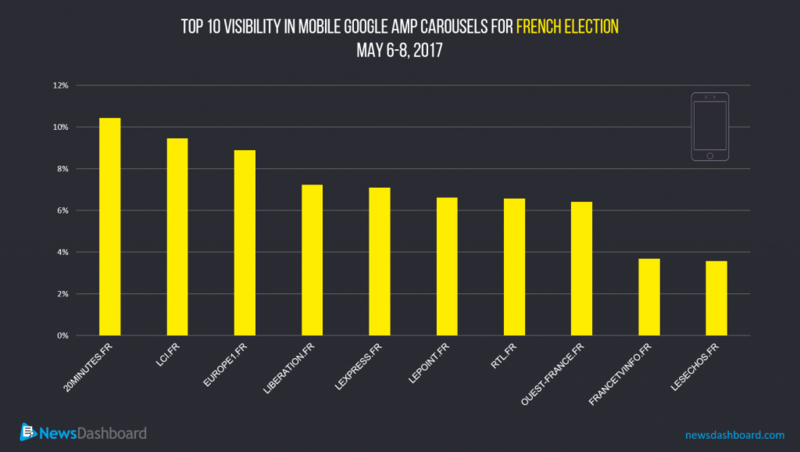 What have we learned throughout the French election from a Google News SEO perspective?